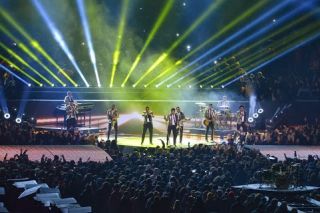 For the Super Bowl Halftime Show, 330 Clay Paky Sharpys and a dozen Clay Paky A.leda B-EYE K20s were on hand to illuminate the stage while a grandMA2 light took command of the media. A.C.T Lighting is the distributor of Clay Paky and MA Lighting in North America. Barnhart calls the Sharpys “workhorses” and says that, “one of the goals in an outdoor stadium is to maintain an atmosphere to maintain the beam; that’s hard to do with high winds. But Sharpy is quick instrument with an extremely tight, bright beam.” He placed Sharpys on the three balcony facias throughout the stadium, on a series of trusses and around the main stage hanging them in clusters of three or six for symmetry. Barnhart placed six Clay Paky A.leda B-EYE K20 innovative, LED-based moving lights on each side of the stage. “I saw the fixtures at A.C.T in New Jersey and thought they could be really interesting in Bob’s lighting design,” recalls Grill.